The FC Thunder Academy Program is designed for players in the U7-U10 age groups. (Currently birth years 2009, 2010, 2011 and 2012) interested in developing their ability by receiving coaching from experienced, licensed, professional trainers. Our Academy trainers hold licenses from the US Soccer Federation (USSF), National Soccer Coaches Association of America (NSCAA), and even the English Football Association (FA). FC Thunder Academy players follow a club curriculum to develop technical ability and independent decision-making, both on and off the ball, in individual and group attacking and defending situations. FC Thunder competes in the prestigious SA-PDF league that includes the top clubs in the San Antonio area such as SA City, Classics Elite, Lions FC, SA United, River City Premier and Alamo Heights. Academy Directors from these clubs have come together to develop a player-centered league dedicated to development, quality competition and organization. The season consists of 8-10 games, beginning in September in the Fall and February in the Spring. Games are held every Saturday at a host location from one of the SA-PDF teams. Players are not required to try-out, but will be placed with a group of players of a similar ability and interest in the game. 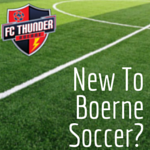 *Games will be played at Boerne City Park (BCP), San Antonio, Bulverde and Schertz. Our Academy program participates in 2-3 tournaments each season. Tournament participation is optional. Fees are not included with Academy. Tournament fee will be split between the participating players. Spring Season: $500 (Register by 12/31/18 to receive a $50 discount). Minimum of two 90-minute practice sessions per week (16 to 18 weeks). Spring Season: $450 (Register by 12/31/18 to receive a $50 discount). Minimum of two 60-minute practice sessions per week (16 to 18 weeks). *2011 Birth year price is dependent on team placement. 2011’s playing on a 2010 team will pay the price of the 2010’s. 2011’s placed on a 2011 team will receive a $50 refund. Minimum of 2 optional tournaments per season. 1 Qualified, professionally licensed FC Thunder coach per team, with player development overseen by FC Thunder Academy Director, Jarred Harriott. Why make the move to FC Thunder Academy? Does your child LOVE soccer? Do they have the dream to play in High School, Select, College, or even Professionally? Then the FC Thunder Academy Program is the place to begin their journey! What are the differences between Rec and Academy? Academy is the way to go if you want your player to be challenged and taught with clear opportunities for progression. Academy bridges the gap between Rec soccer and Select soccer. It is the optimal pathway to playing at the Select level. *Always inquire and ask questions regarding your coaches experience. Don’t just assume they know what they are doing. *All Quality clubs list coaches, bios and/or teams coached. Click here to access contact information for Age Group Directors and Coordinators.